The Centre for e-Learning delivers a strategic support service to lecturers and researchers in the effective pedagogical use of networked computer technologies for teaching and learning. The centre has been the custodian of the online learner management system (LMS) since 2000. The LMS provides a secure and stable environment for teaching and learning activities, in line with the 2004 White Paper on e-education. 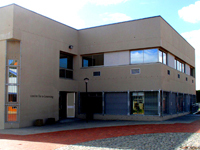 The LMS at CPUT, also known as MyClassroom can be accessed directly at http://myclassroom.cput.ac.za/ 24 hours a day from any location with an Internet connection, using desktop computers, laptops, notebooks, tablets and even some smart phones. Staff at the Centre for e-Learning provide training in the use of the LMS and assist lecturers and researchers in designing online teaching and learning material. The system enables lecturers to facilitate the learning process by applying various modes of online teaching. The traditional face-to-face classroom activity is enhanced with synchronous and asynchronous activities. The student is able to access learning materials, interact with fellow learners and ask questions. Students can receive assistance from lecturers or tutors and submit online assessments and assignments.